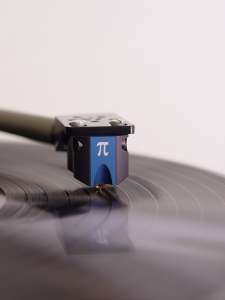 The cartridge »Pi« has been developed together with our tonearms. With an ingenious mounting of the different parts, the case is highly resonance optimized and with its dynamic mass corresponds perfectly with our tonearms. Due to its neutrality it complements most other tonearms as well. The stylus is mounted on a boron cantilever and drives a copper voice coil. Most attention was given to the rigidity of the magnetic circuit to prevent eddy currents. The MC cartridge has a similar output voltage as our EMT-ti. By this it drives preamp inputs in their best dynamic range. Due to its relatively high output voltage even on quite insensitive inputs the smallest signals will not be lost in the noise fl oor. The cartridge works perfectly on loads of 600 Ohms and matches best to our phono preamps. The cartridge has an own mass of 14 grams which leads to a high trackability with a tracking force of 1.8 to 2.0 ponds. The »Pi« will be delivered with special screws that optimize the coupling to the headshell. »Dynamics, fine and coarse structures, dimensionality - all that is on a very high level. So we immediately grow fond of the new cartridge. It plays very close to the top references and it‘s the recommendation for everyone who wants to listen on a very high level without spending a huge sum of money. The Pi is a strong opener and a luminating sign to the analogue passion of the Brinkmann products - not only for their own turntables.